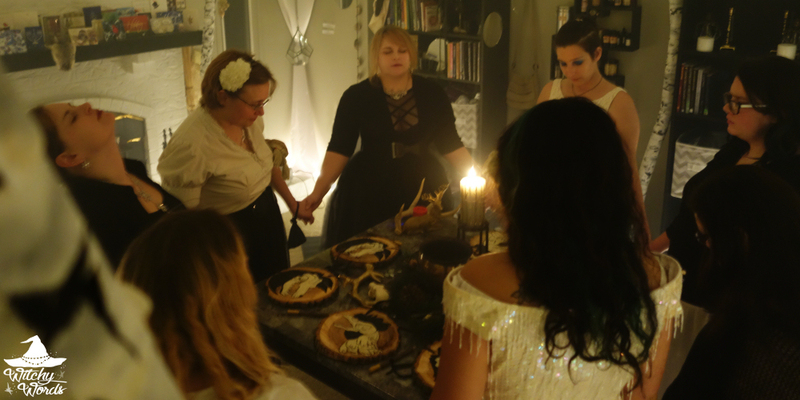 One repeated suggestion I saw in the survey I released in December was the request for more details about the planning of our sabbat rituals. Because each Primary Member works on their sabbat ritual alone, I can't give you much insight into the planning of those. I can, however, go into detail about the work and inspiration behind the scenes of my Wild Hunt ritual from Yule 2017. For those who may not know how my circle works, each Primary Member is assigned a sabbat ritual to write and lead every year. This takes the pressure off of the entire circle planning rituals and gives everyone a bit of anticipation and surprise walking into each sabbat. In November, Primary Members let me know their top three picks in order of most wanted to least wanted and I do my best to give everyone a sabbat they truly want. Honestly, everyone's top pick is typically different and it tends to work out. I also notoriously take whatever sabbat no one wants, which helps alleviate any potential struggle, I think. For 2017, my sabbat was the Winter Solstice / Yule. By November of the year prior, we know what our sabbat choice is. That gives everyone the entire year until their sabbat to plan for it (and, for February Eve, at least three months). Some members immediately write out their sabbat and have it planned within the month after it's assigned. Others wait until closer to time. As much as I like being on top of things, I typically need seasonal inspiration to truly know what I'm doing. Each attending member contributes $15 towards each sabbat, and the sabbat leader is expected to contribute $15 of their own money. With six primaries, including myself, I can expect $90 each ritual. Shortly after the New Year, I started collecting wood or woodland-based items for the ritual with no clear purpose: Pencils made from sticks with the bark still attached, a gold and white birch tree pillar candle, pine cone shaped tealights, etc. I found them each on sale from the holidays and utilized those sales to minimalize the cost. The less I spend on each item, the more I can provide. 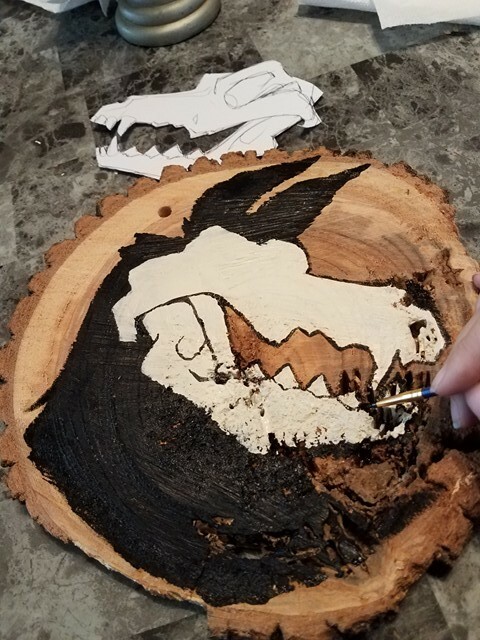 When our tree fell during the March 2017 storm, I knew I wanted to incorporate the wood in some way. I just wasn't sure how yet. Between renovations, the GGG main ritual and community problems, the next time I really thought about Yule came in late September. I was standing under a tent at an event in Arkansas for my job. 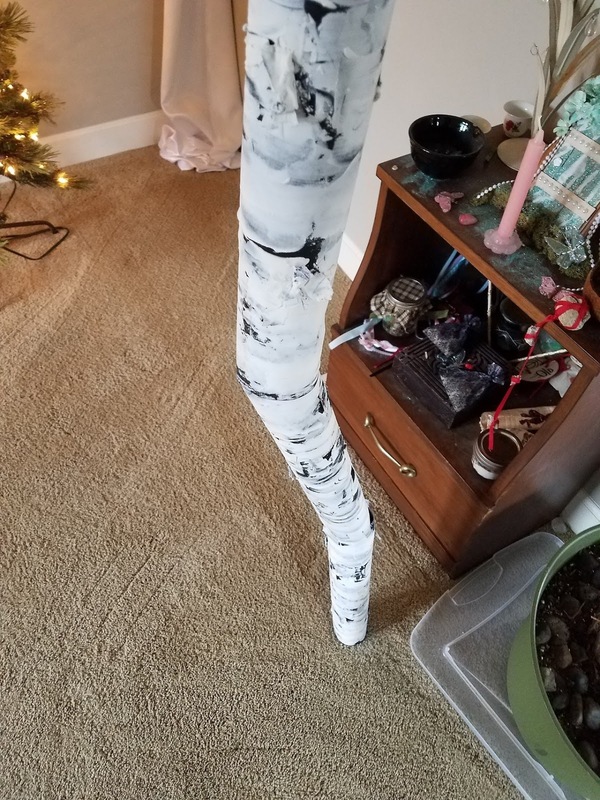 It was a slow day with no one to draw and I remember randomly texting my husband, "Pool noodles as fake trees for Yule." I have no idea where it came from. No one was carrying wood or pool noodles. No trees or swimming pools were around. I was in the middle of a parking lot. Something just... hit me. I tucked that note in the back pocket of my brain. As Samhain neared, I saw more talk of the Wild Hunt pop up in various forms, from the magazine I help edit to Tumblr to random articles passing my Facebook newsfeed. Particularly associated with the Winter Solstice, I decided this was the theme I wanted to take. On November 10th, I ordered the pool noodles. 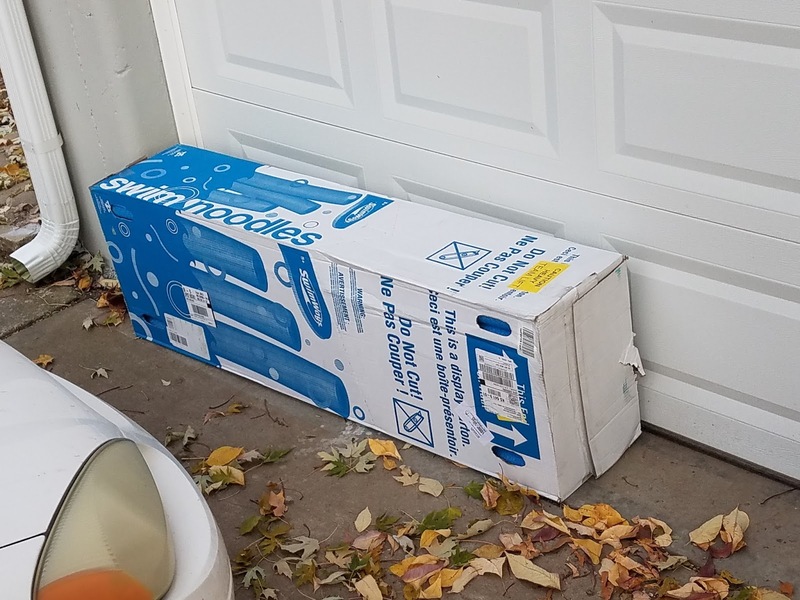 I mused to my circle about how the UPS guy must have felt delivering a massive box of pool noodles to a house without a pool in the middle of November. I started researching the Wild Hunt at that point, trying to get a gasp on exactly elements I wanted to incorporate. Stories radically varied and I found myself more confused than actually making any progress. 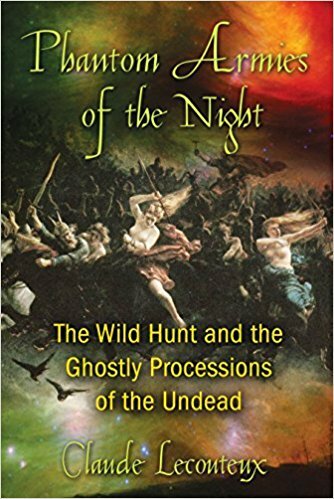 Eventually, I ran across Claude Lecouteux's Phantom Armies of the Night: The Wild Hunt and the Ghostly Processions of the Undead. A book specifically analyzing various accounts of the Wild Hunt? Count me in. I purchased that November 14th. It took me the better part of a month to get through the book. Though he's probably the best author on the topic (and one of the only), Lecouteux's writing is extremely dry. It sometimes presents information without any real need or basis, and with no conclusion or connection to the bulk of the text. I found myself reading passages to my husband in hopes that two brains are better than one in analyzing the text. I kept notes on the book of accounts that helped me better understand what the Wild Hunt was and could be, and elements I wanted to incorporate into ritual. Pieces would spark ideas and I'd jot them down. Other sources I utilized were Wild Hunt and the Witches Sabbath - R. E. Hutton (2014) and Wild Huntsman Legends - D. L. Ashliman (2013). By the time I finished the book and other sources, I had three pages front and back of notes - and, finally, a direct understanding of exactly what the Wild Hunt is. I knew the Hunt came from old accounts of the sabbath and that witches were naturally part of it. I knew I wanted my circlemates to meet the Hunter at the crossroads and request something needed. I knew that I wanted them to be fully immersed and surprised by the ritual, which meant no notice or preparations. That meant that they needed to do all of their meditating and decision making within the circle. I was at least getting somewhere. 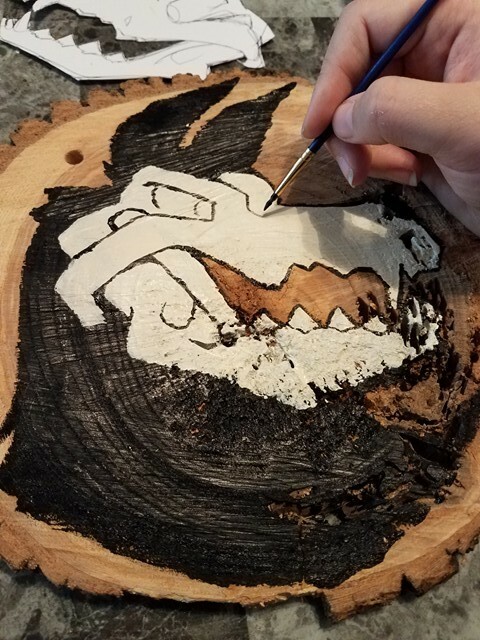 I got to work immediately on the wood from the fallen tree in March. 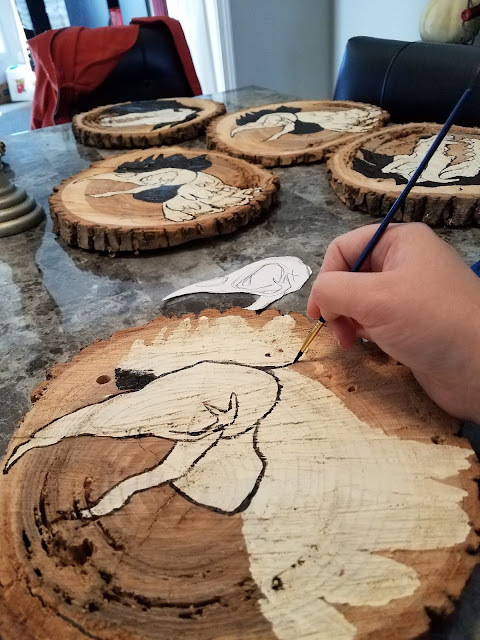 Now that I knew the dichotomy of the Black Dog, representing death, and the White Rooster, representing life, I knew that I wanted to create plaques for my covenmates. These plaques would help in their decision making process for what they requested of the Hunter. 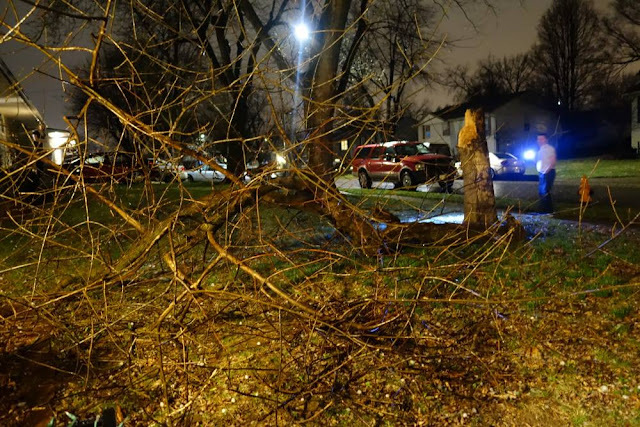 I started first by sawing the largest stumps of the tree into discs. I then sketched the Black Dog and White Rooster as I wanted them to appear on pieces of card stock. I cut them out to utilize as templates for the plaques as I had to make multiples of each one. Once I had the white and black layered appropriately, I took a small paintbrush and outlined the skull parts, adding in the fine details. You can see my original sketch cut out of card stock above the plaque. For the White Rooster, I would use the template to make the entire silhouette white, then go back in to paint the large black spaces. Once completed, all of the plaques were taken downstairs to be treated. The plaques didn't take terribly long in and of themselves. The drying time was really the biggest test of patience. One night just a week and a half out from Yule while waiting for coats of paint to dry, I was watching Lucifer to pass the time. In this episode, a song played that I had never heard before and I was immediately inspired. As I mentioned above - I loathe waiting until the last minute to prep a ritual. The week before certainly seemed very last minute. But, if I hadn't waited until this point, I wouldn't have this impressive song. Music is incredibly important in setting the mood of my rituals. I almost always open ritual up with a song and utilize that song to build energy. Remember last year's Samhain with I Will Never Die by Delta Rae? Or Seven Devils by Florence + the Machine for 2015? Usually, I secure this song early in the year. This year, I had to wait until the last minute to find my song and it was perfect. I pulled it up on Youtube and let it play in the background while I worked on my ritual. That's when it naturally rolled over to another related song which was also perfect for the ritual! I was spoiled for song choice! At first, I felt like I had to choose between the two since I typically only use one song per ritual. I swapped songs out repeatedly throughout the next couple of days because I just couldn't choose. Three inspiring songs! And this one sounded perfect for the Hunter portion of the ritual. With In the Shadows at the start and Breathe at the end, the ritual was perfectly punctuated by songs - and I was able to finish editing the ritual. I had gotten it to a point where I was happy and it felt complete. I knew I wanted three main components to the ritual: The plaques determined if your need was a death or rebirth utilized the Black Dog and White Rooster themes of the Wild Hunt; mirrors would allow you to speak with your Double, another major theme of the hunt, to give you more insight into what your need was; and, finally, we would meet the Hunter at the crossroads and deliver our letters to him to fulfill our needs. Originally, I was going to thrift store the mirrors but, as time drew near and smaller mirrors were hard to find, I purchased them online for pretty cheap. That resolved that portion. But creating the crossroads in the woods was another. I found a couple hallway runners at a thrift store in my search for mirrors. Cutting them in half created four "roads" that met in the middle. 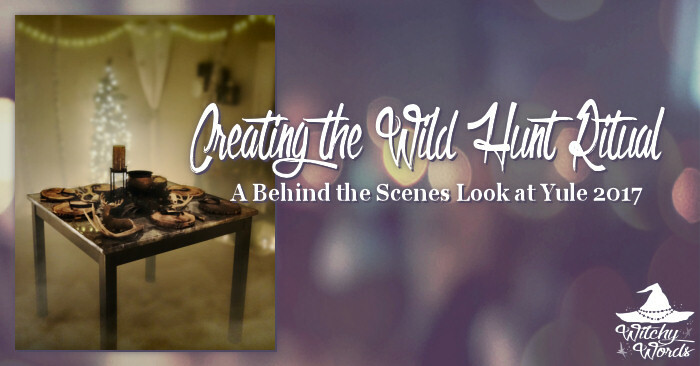 But the Hunt typically occurs in a wooded area and I needed to create the forest. That's where the pool noodles came in! The faux forest was largely experimental all the way through. 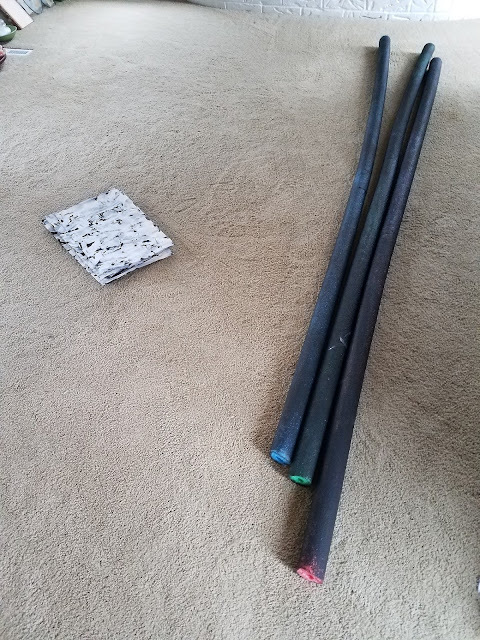 I started by painting the pool noodles black. Originally, I thought I'd be creating the birch look on the noodles, so I didn't want anything to show through. 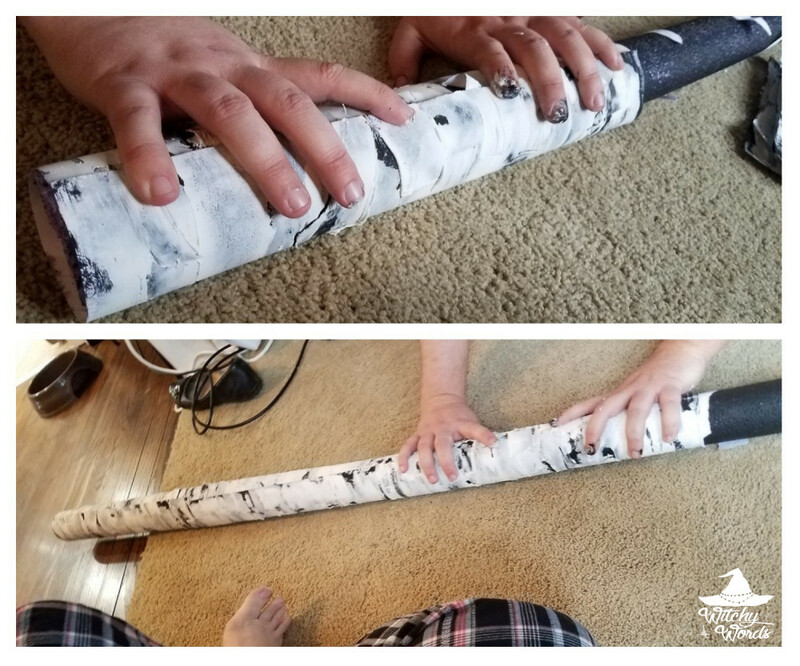 But, when taping paper and puttying pool noodles proved too difficult and time-consuming for the short three days I had remaining, I changed my plan. Using card stock from work, I created sheet upon sheet upon sheet of "birch paper." 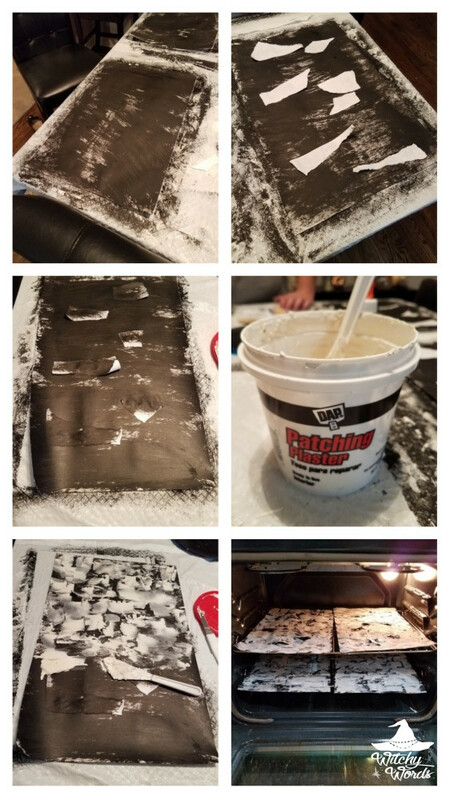 I first painted the paper black, then used Elmer's glue to glue down shredded pieces of printer paper to it. I then painted that black. 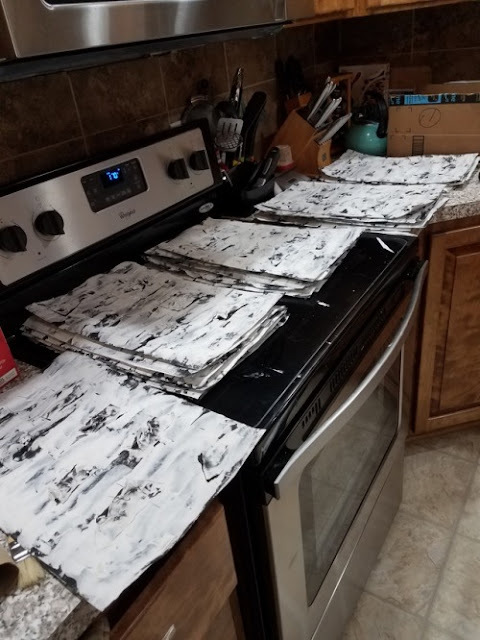 Using dry wall plaster and a putty knife, I haphazardly applied the putty, attempting to keep the smears horizontal. Once complete, I stuck them in the oven on the lowest temperature setting to help speed up the drying process. 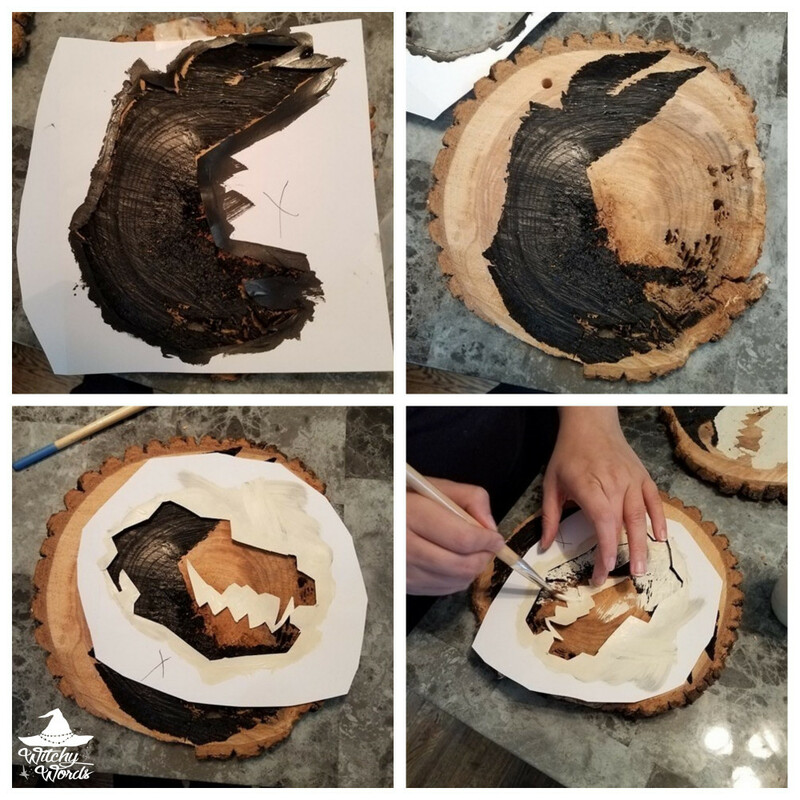 The whole thing was a modified process of Aimee's faux birch paper posted on her blog Twigg Studios here. Measuring, I knew I needed 6 sheets per pool noodle. To get as many pool noodle trees as I considered bare minimum, I would need 48 sheets. 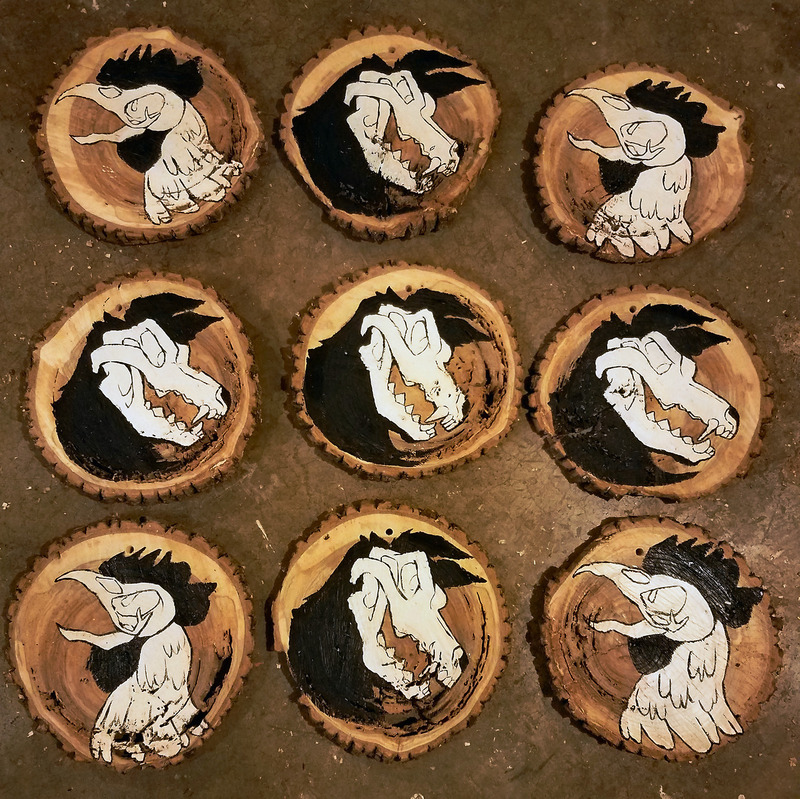 After making a set of six, I took a break to give it a test run. This part was definitely a two person job. Someone needed to apply the hot glue and another needed to roll the pool noodle into the paper and hold it until the glue cooled and dried. 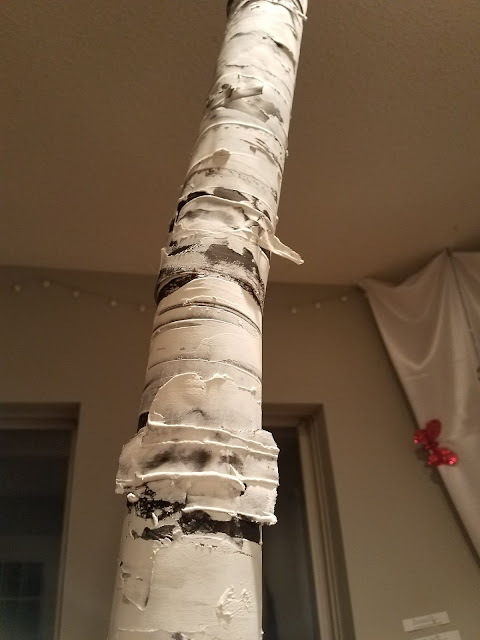 I glued each paper in two places: One line sealed the paper to the pool noodle and another line on the other edge glued the paper together in a ring around the noodle. Originally, I was concerned that this method would create an obvious wrapping paper effect on the noodles, making them look less realistic. That's why I wanted to apply the birch look directly to the pool noodle. Turns out, though, that the segmented card stock gave me an even better effect! 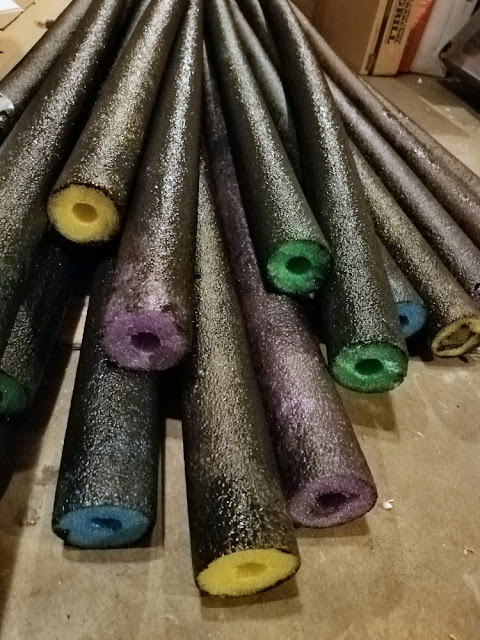 Instead of the pool noodles being pillars of faux birch, the segments allowed them to be crooked, twist and turn just like real birch does. Honestly, I didn't think they'd look even half this realistic! I also didn't notice much of a patterning effect like I anticipated. In fact, I was hard pressed to see where one sheet ended and another began! Even though they were just background decoration to the ritual, I was incredibly happy with how the trees turned out. It was so important to create a "woodland" setting and these fake birch trees did the job perfectly. Plus, if they wanted, circlemates could take them home afterward. 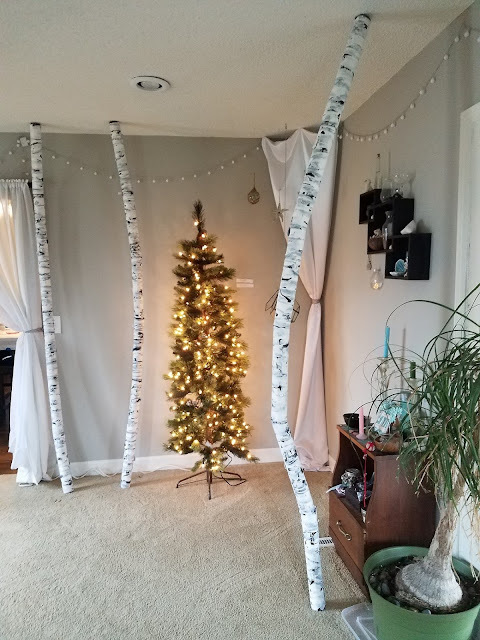 I had no use for permanent faux birch trees in my ritual room, especially since we decorate differently for each holiday. Also, admittedly, after some days standing up, they started to slump. A few dowel rods through the center would likely help that but, at this point, Yule had come and gone. I was ready to be done. What birch trees were left are now stored in my garage. That should wrap up the entirety of my thoughts, inspiration and preparation for the Winter Solstice ritual last year. If you have any questions, feel free to let me know in the comments section below!